with WC, bidet, shower and window. 15sq.mts comfortable for outdoor eating with patio furniture. PLEASE NOTE : From Dec. 23rd to Jan 7th the minimum stay is 7 nights. Independent heating, internet connection, tv, wm, a/c, stereo, terrace. Monthly possible. Hey, welcome to the Enclave of Cool! My apartment is located in the up and coming area called Pigneto, this is arguably the trendiest place in town now. You will be in the big city's heart, still you'll feel like in a welcoming village! the main railway station and the "A" line of the underground ("Vittorio Emanuele" Stop) are just a few tram stops away, and the metro links you to San Pietro, Musei Vaticani, Piazza di Spagna, Piazza del Popolo, Fontana di Trevi, Pantheon etc. The University area is 10/15 minutes away, Villa Borghese, The Galleria Nazionale d'Arte Moderna and San Pietro and Musei Vaticani. PLEASE NOTE: Clients have been complaining about the sofa -I changed it!-, please see the picture as a stand alone with the other apts pictures. You'll love it! Please Read: If you're more than 2 people you should be a family with kids to be comfortable, most two couples of adults that rented my apartment ended up complaining. Because there is only one bathroom (one toilet, one shower, one bathroom sink and bidet) for the whole apartment and also because the window of the living, though I added dark screens, still some light in in the mornings will sneak through. Nothing terrible I think, but this is a very sunny apartment and I've had some complaints. For transportation take the trams going to termini from via Prenestina (4 and 14) it won't take you long and from there take the metro and buses to pretty much anywhere in Rome. Just around the corner from the apartment, out of the building go left one block. It's my favorite both for breakfast and lunch. Great athmosphere. Recommended! We stayed in Guglielmo’s apartment for a month and enjoyed it. It’s small, but more than sufficient for a couple. What makes this place really special is its big terrace – we spent a lot of time there. Guglielmo is the nicest guy, very friendly, and when we had a small problem with the hot water, he immediately came over and fixed it. Thank you, Guglielmo! The area is very hip and lively, with lots of restaurants, excellent pizza parlors, and the great Café Necci (with its beautiful garden) just a few steps away. Due to that, it can be a bit noisy at weekend nights, so bring ear plugs if you are a light sleeper. The apartment would benefit from a little updating and thorough cleaning. Apart from that, we were happy there. The apartment is super comfortable and the location is really in an interesting area with fun restaurants and shops. Everything was just as described and worked as expected. The host could not have been nicer or more accommodating. Very good communication and a great host, Guglielmo did everything so we feel comfortable during our stay. The flat is practical and very good located ; there are also bus 81 and tram 14/5 stops not far away from the apartment. I recommend warmly ! Guglielmo est l'hôte parfait! Très réactif, très bonne communication et surtout Guglielmo est vraiment sympathique et arrangeant. Son appartement, idéal pour un couple, est bien situé dans ce quartier sympa du Pigneto (de nombreux bars/resto et petits supermarchés à proximité). Il a une superbe terrasse et tout le nécessaire pour se sentir chez soi. J'y ai passé un très agréable séjour et je vous le recommande. If you have been to Rome many times you will find this area very different and really fun. Pigneto is very trendy and filled with great restaurants and cafes. The apartment is good. It is quaint and has the basics. Good for two people but small for more than that. Terrace is really nice. Big draw back is that is a good 5 min walk from public transportation (trams 14 and 4; bus 81, 105). If you stay here, don't miss Necci's right on the corner from the apartment. Great place for a coffee or drink and even have a really good dinner menu. The landlady is very nice (we saw her 5-10 Min). We slept well there, even if a lot of airplaines during the day are flying over this area. The connection to the city is not bad (tram 15 min to the Termini) but this information was not provided by the landlady, so we had problem to find this out. This same with recommendation for restaurants close to the appartment. She is not living in this are (50km from Rome) and could not help with Rome travel, sightseeing etc, questions. Not a problem at all, but will be nice service to find some information about in the appartment. It's very good place to spend time in Roma. The location is nice (tram 5 and 14 or bus 105 direct to Termini). There are the all house utlilities, one needs in everyday life. (Fix the table, cos' for four person is too small). Great apartment with super convenient location! Tram is just a few blocks away, easy to connect to Metro or get to Termini. Lots of really great food options within the area from super mercados and fresh produce to bakeries, and dining from casual pizzeria to fine dining options all walking distance. Apartment has all the stated amenities, nice terrace, and great Internet connection. We would recommend it. The apt. was clean and ready for us with no trouble, very easy and good experience. We hope that the owner of the appartement was also pleased. Owner Comments: Thank you Lydia, you've been wonderful guests! Very nice appartment. Suitable for 4 not big people. The main disadvantage is the couch in living room/kitchen (to small for 2 people to have a good sleep). Owner Comments: Hi Tomasz, Thank you! We have changed the couch and placed a brand new one in which is much bigger and more comfortable, sorry for any trouble, we hope to work with you again soon!! What a great experience to be able to live within a beautiful community and not just as a 'tourist'. I had a wonderful time getting to know the area and the people that live and work there. If you love to walk - The Termini station is about 40 mins one way and easy to get to by bus as well. I have to thank everyone for making this part of my trip easy and relaxing. The joy of being able to cook at my apartment with a gas stove and sit out on the terrace was worth it all. I will recommend this to anyone who wants to explore Italy and not be stuck in a hotel room. 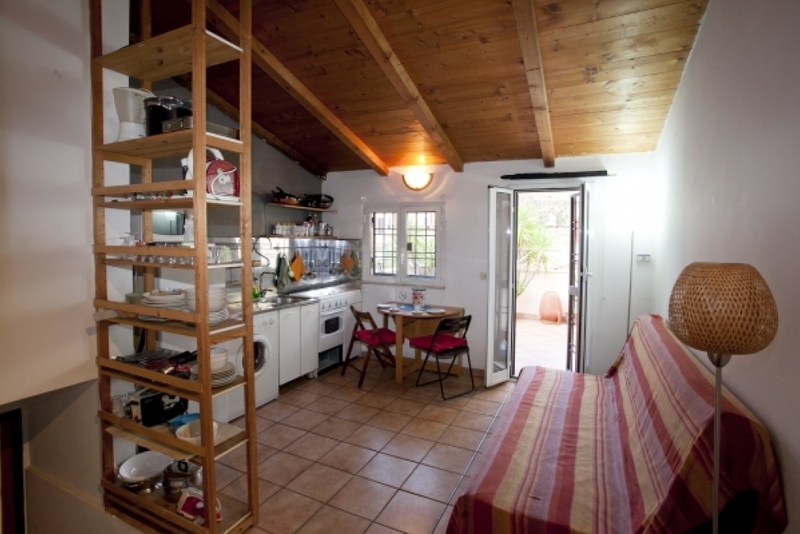 A really good base for 2 persons stay in Rome. Away from the noise of the Center but pretty close if you use the Bus. The Terrace is a scoop. We loved it and was using it a lot. Excellent service from Maria the key holder whose advice in good English was most welcome. A nice apartment in a residential area with nearby supermarket, bars, restaurants and with good transport links into the city centre (Trams 5 & 14 direct to Termini station). Whist the linen, the bed, the toilet and kitchen sink areas were clean the apartment generally was in a poor state of cleanliness and much in need of refurbishment. The room terrace was very spacious and was an excellent area for eating and drinks in the evening however the provision of a further sun lounger would have been welcomed. Overall the apartment was very good value and we very much enjoyed our stay. Owner Comments: Hi Derek, Your feedback is indeed greatly appreciated. We'll tell Maria both about your nice words and your note on the general cleanliness of the apartment, she takes care of that. We'll also investigate to see what can be improved from that point of view. We'll make sure to add the sun lounger asap in the terrace. Again thank you for your much needed tips, we really appreciate it. l'appartement est un peu loin du centre historique, mais entre le tram et le bus ça va. Il est agréable, calme, sa terrasse est un petit bonheur après avoir arpenté les rues toute la journée. par contre nous avons du refaire toute la vaisselle qui n'était vraiment pas propre. Je pense que ce petit point négatif peut être facilement arrangé. Merci pour vos commentaires! je suis navré pour la vaisselle. Je vais m'assurer que tout soit propre pour les prochains clients. Merci d'avoir pris le temps de poster vos commentaires. Not suitable for 3 persons. The sleeping couch is very very bad for adult people. Too short with a very bad matrass. For 2 people it is ok. When you stay here you have to go to Necci. a very nice place to go for dinner or breakfast at 50 mtr. Owner Comments: Sorry about that! We've changed the couch with a brand new one, much bigger and more comfortable. My friends coming to Italy will look you up for sure! 1) Good for 1-2 persons/a couple. Not good for 3 people as the pull out couch is very small and is not comfortable. 2) Shower leaks a lot of water. Owner's reply: Thank you for your feedback! Sorry you didn't find the couch comfortable, we've just bought a brand new double sofabed much bigger and more comfortable. Still Ikea but much better standard. We're going to look and fix the shower immediately! Some things has to be repared, like table and coffemaschine. The espressomachine missed a handle. Management Replies: Thanks for the heads up! We'll fix them immediately! Ferienwohnung in einem interessanten, lebhaften Viertel Roms. Wir haben dort zu zweit drei schone Wochen verbracht. In direkter Nahe gibt es mit den Supermarkten TODIS (via conte di carmagnola) und CONAD (via del pigneto) preiswerte Einkaufsmaglichkeiten. Die Ausstattung der Wohnung ist in Ordnung, der recht schnelle Internetzugang ist auch per Netzwerkkabel nutzbar. In die Innen-Stadt kommt man schnell per Strassenbahn (S.Elena) oder mit dem Bus (Linie 105). Die Abwickelung uber Romanreference war vorbildlich, hat alles bestens geklappt - einschliesslich Flughafen-Shuttle und Kautionsabwicklung. Wir werden den Veranstalter auch fur andere Stadtereisen nutzen. The apartment was just as I expected. Clean, tidy and very pleasant. People in the area were very helpful and it was great at have Necci across the street! Tré bon accueil du propriétaire. Appartement propre et plein de charme. Des produits d'utilisation courante sont sur place ce qui est agréable lorsque l'on vient d'arriver et que les courses n'ont pas été effectué (sel, liquide vaisselle, lessive, huile, vinaigre) , le lit était fait (bien agréable aussi) et la terrasse, quel bonheur. Le quartier est un peu reculé du centre mais facile d'accès (tram à proximité jusqu'à minuit environ). apartment was accurately represented by photos and description on website, was comfortable and quiet, and provided a good place to stay during our visit. It was initially a bit difficult to find, but once we had familiarized ourselves with the area it was very easy to get from there to the historical areas of Rome. Overall we were very satisfied with our stay. Appartement trÃ¨s agrÃ©able, dans un quartier populaire et vivant, trÃ¨s bien desservi par les transports en commun. Seul bÃ©mol : il est prÃ©vu pour 3 couchages, mais il convient Ã un couple avec enfant, et non pour 3 adultes, car le couchage du salon est Ã la limite du confortable et le logement n'est pas conÃ§u pour une telle cohabitation (il faut traverser la chambre pour aller Ã la salle de bains par exemple...) ne convient pas Ã 3 adultes pour un sÃ©jour un peu long. The apartment and the neighborhood were very pleasant. We believe this is an apartment for 2 adults with children, but not for 3 or 4 adults. The second bed is really not sufficient. It would be nice to have a salad bowl, a pair of scissors, clothes pegs and a deckchair. Owner Comments: Thank you! We've bought a new salad bowl, scissors and clothes pegs, there is no deckchair right now, but plenty of chairs in the terrace (4) + 3 in the apartment. It must be stressed that all the items you mention was here until very recently and it's either been broken or lost by previous clients, we appreciate that you inform us immediately if something is missing so that we can replace it. Regarding the sofabed it's has just been changed with a brand new double sofa bed of much better standard. Please excuse the issue. Although the apartment was located a little away from the center, it was still perfect. Loved the terrace and of course the cutest kitchen & living room area. Heating and water pressure were great, too. Een aangenaam appartement waar wij ons meteen thuis voelden. Geen gehorige bovenburen, geen inkijk, een rustige straat, dus je voelt je lekker vrij! Goede winkels in de buurt om zelf heerlijk te koken, en een leuk cafe en restaurant in de straat (waar wij helaas niet aan toe zijn gekomen). Vanuit een appartement de stad verkennen is ideaal gebleken, wij zullen een volgende keer eerst bij Roman reference gaan kijken als we, zeg naar Berlijn gaan! Das Appartement war sehr schmutzig. Es wurde offensichtlich nur oberflÃ¤chlich drÃ¼bergewischt, alles was man anfasste klebte. Bei unserer Ankunft stand dreckiges GEschirr in der SpÃ¼le, TÃ¶pfe und Herd waren sehr dreckig. Nach 2 Tagen brachte der Besitzer als "Ausgleich" einen groÃŸen Topf und einige GerÃ¤te (Mikrowelle, etc..), mit dem Dreck wurden wir aber allein gelassen. Zudem ist es nachts so laut auf der StraÃŸe, dass man die Fenster im Schlafzimmer geschlossen halten muss. Insgesamt kÃ¶nnen wir die Wohnung nicht empfehlen. Owner of Apartment Replies: Dear Susanne, how unfair! I'm aghast. Keyholder informed me on arrival that I had forgotten three glasses in the kitchen sink (I had shown the apartment to a client the day before) and that you were complaining. So I called you and you said also that the kitchen pots were old, never mentioning that the apartment was dirty simply because it was not the case and I had verified that personally the day before your arrival. To make up, the day after (not two days after) I brought you what you dismiss as 'einige GerÃ¤te': a brand new pot, a brand new microwave, a brand new German coffee maker with filters, a brand new electric water kettle, 6 wine glasses and a used iron table of very good quality, for the terrace. This is how you thank me, let's say I would have much preferred a phone call! Regarding the bed room, it overlooks a street with bumpers where cars are obliged to go slowly, it's a small street and there is no heavy traffic. Anyway if you are sensitive to noice you can always close the window and turn on the air conditioning. Splendid value for money and as others have said, it is close enough to Rome centre for transport to be easy enough once mastered. The apartment was perfectly pleasant with enough amenities near by but unfortunately we did suffer rather greatly from a large volume of builders near by throughout our stay. Appartement agrÃ©able, spacieux et fonctionnel oÃ¹ il fait bon vivre dans un quartier attachant. Le lave-linge fonctionne aprÃ¨s avoir ouvert le robinet d'eau. Bon accueil, de Enzo. The apartment was perfect, lovely to have a roof terrace, close to shops but away from the busy centre of Roma. Everything worked except the lavatrice which does not seem to fill with water. I loved being out of the touristy centre but close enough via a very good tram to get to my language school in Termini. Manager Note Sorry for your problems with the washing machine. Under the sink there is a tab to open the water for the washing machine, I'll make sure the keyholder shows it to clients always from now on, he may have forgot in your case. Do give us a call next time and thanks a lot for your feedback! This apartment was perfect for me. I was in Rome principally to improve my italian and attend classes but also to go to the Champions League Final. I loved being in a Roman suburb out of the touristy centre but only a 15 mins tram ride away from the centre, my classes and the opera. I liked the feel of the area, the local bars, the market on Via Pigneto and the shops. Pour des italiens, oublier la cafetiÃ¨re! Appartement agrÃ©able et belle terrasse. RÃ©ponse du PropriÃ©taire: DÃ©solÃ©! J'ai achetÃ© une cafetiere Ã filtre et une caffetiÃ¨re Moka. The apartment has been a wonderful place to stay and we would recommend it. The bus ride was a minor issue compared to the peace and comfort we lived in. We enjoyed every minute of our apartment and have no major complaints about it. The neighborhood was wonderful and the people were friendly. Both Tara and I feel that we got to experience a part of Rome outside of the center that reflects the true culture of Rome today. Thank you for allowing us that opportunity. Although the location was not central it was easy to get to the center. It was a great neighborhood and the apartment was very well equipped.